When I was pregnant with Sancho, I would only accept one peace offering from my husband when we would get into an argument, pomelo. How cheap, right? But being the fruit monster that I was and still am, it was like he just gave me the moon. I love love looooove pomelo to bits. I had to add a pomelo recipe to my repertoire as an ode to my undying loyalty to the fruit. 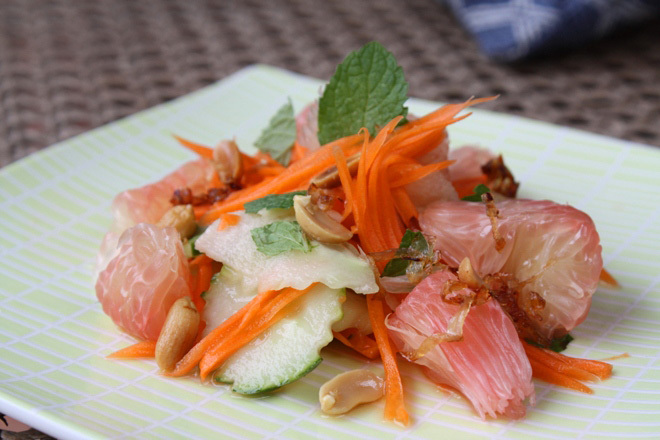 Many versions of this recipe are posted online for sure but this is my own take on the Vietnamese Pomelo Salad. Hope you like it! Put oil in a wok or sauté pan, cook the shallots until caramelized, about 3 minutes. Allow the shallots to cool for a few minutes, then toss with the carrots, cucumber and jicama. Add the mint, chopped peanuts, and dressing and toss well. Transfer to a plate or large bowl and arrange pomelo cubes on the side of the salad. Serve.